On July 1, Canadians across the country and around the world show their pride in their history, culture and achievements with celebrations and festivities. 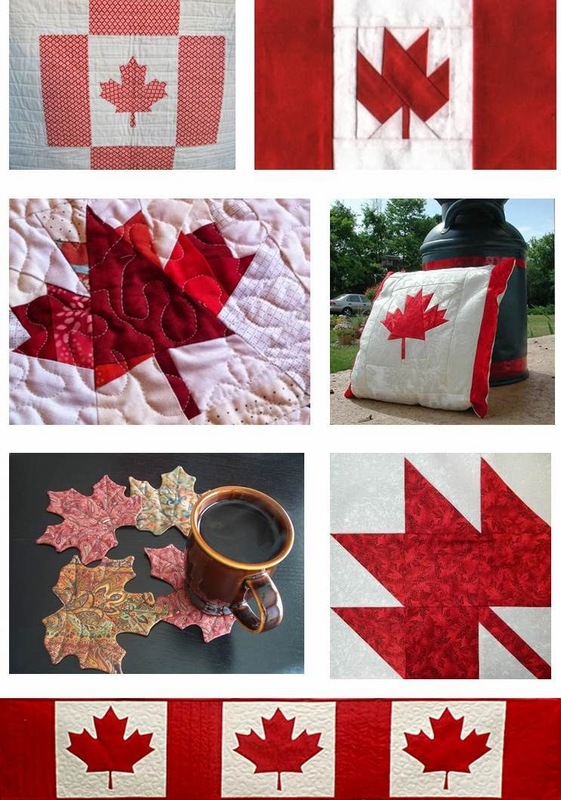 In honor of Canada's birthday, here are some free Canadian Maple Leaf patterns! (Note: this post was updated on June 11, 2015). 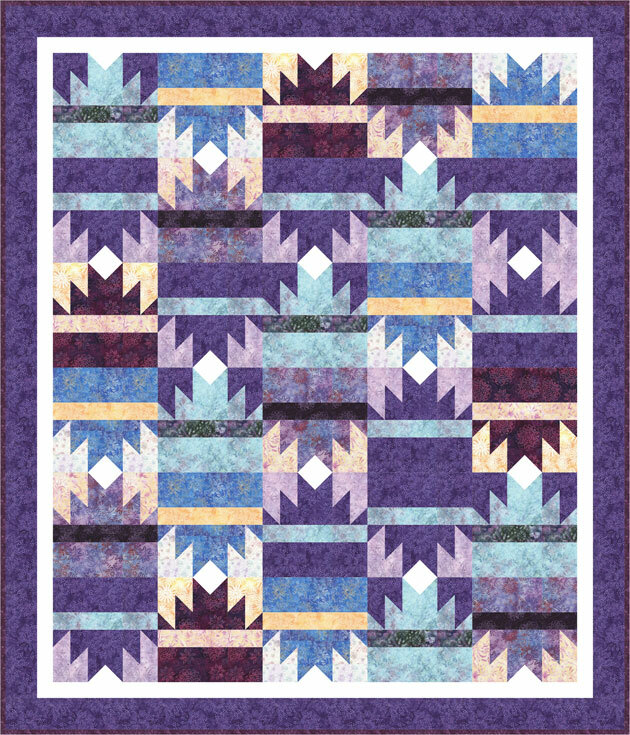 Above, Row 1: Paper piecing maple leaf pattern by Berene Campbell at Happy Sew Lucky; Canadian Flag, free pattern by Christine Thresh at Winnowing. 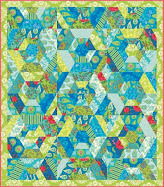 Row 2: Maple leaf block (left), seen in a finished quilt by Carly at Citric Sugar ; free paper pieced pattern (right) by Christina at Christina Creating. 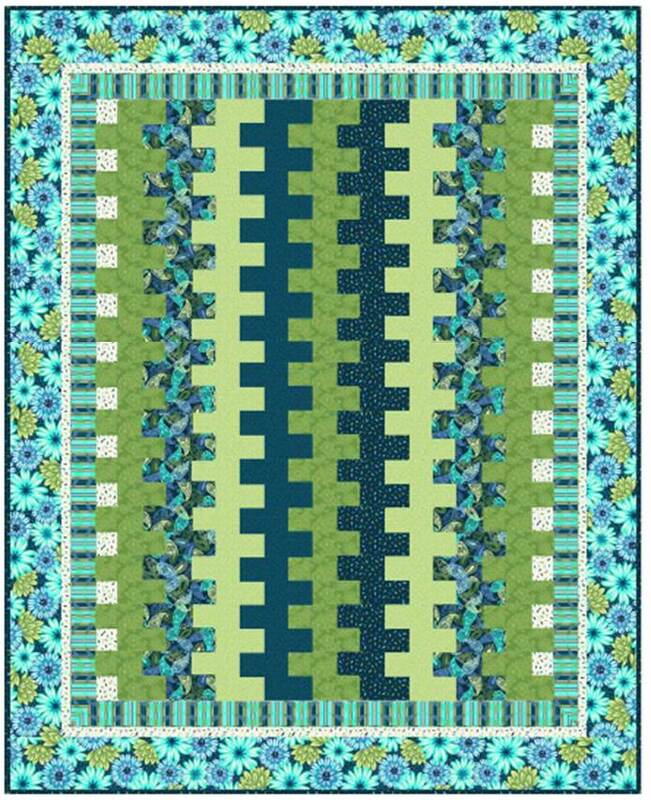 Row 3: Maple Leaf Mug Rug, free template and tutorial by Lara (Buzzin Bumble) at Quilting Board; Maple Leaf free block pattern at Berrima Patchwork. 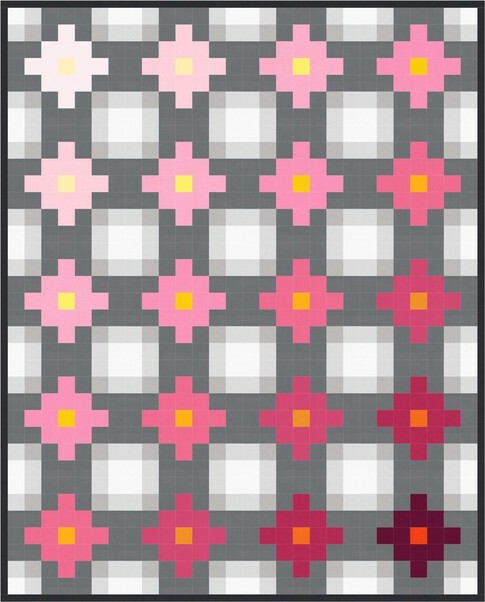 Row 4: Canadian flag table runner, free pattern at Sew Sisters. 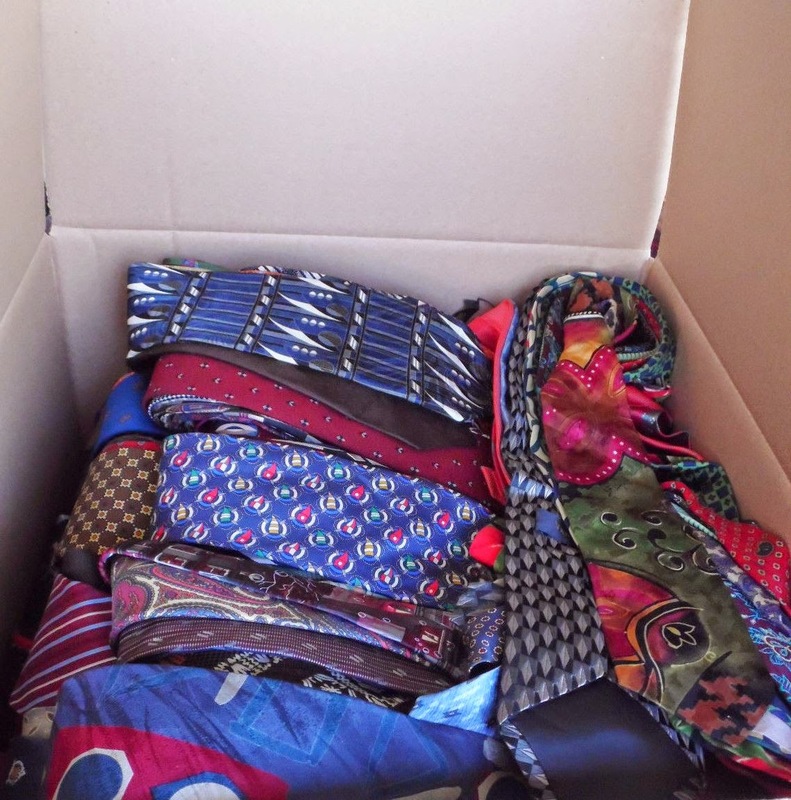 Note: This post was originally published on July 1, 2012 and was updated on June 30, 2014. Canada marks its 147th birthday on July 1 ! Canada Day marks the anniversary of the Constitution Act of 1867, joining Nova Scotia, New Brunswick, and the Canada province (now Ontario and Quebec) into one country. 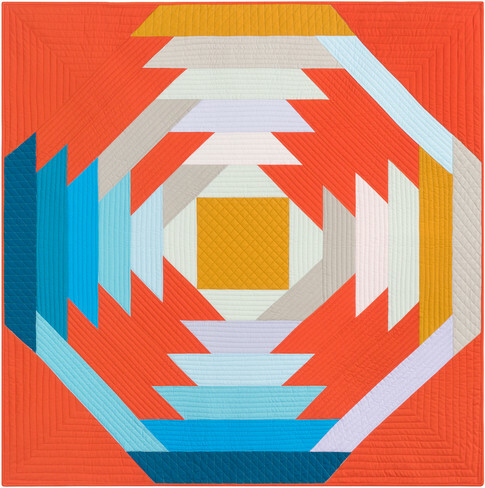 In honor of the occasion, here are beautiful quilts by Canadian artists. 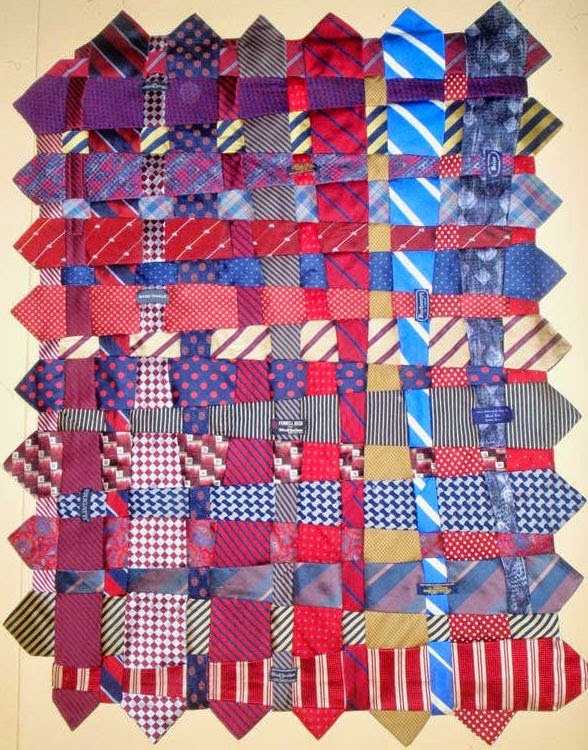 Brigitte Villeneuve says: “What a thrill to paddle on a calm lake looking for a trophy speckled trout in the northern Quebec spruce forest.” She made this original quilt for her oldest son as a souvenir of his first father-and-son expedition. The bright orange vest and plaid shirt of the canoer contrasts perfectly with the blue lake. You can also see the reflections of the figure, and the reflections of the trees, in the rippling water. 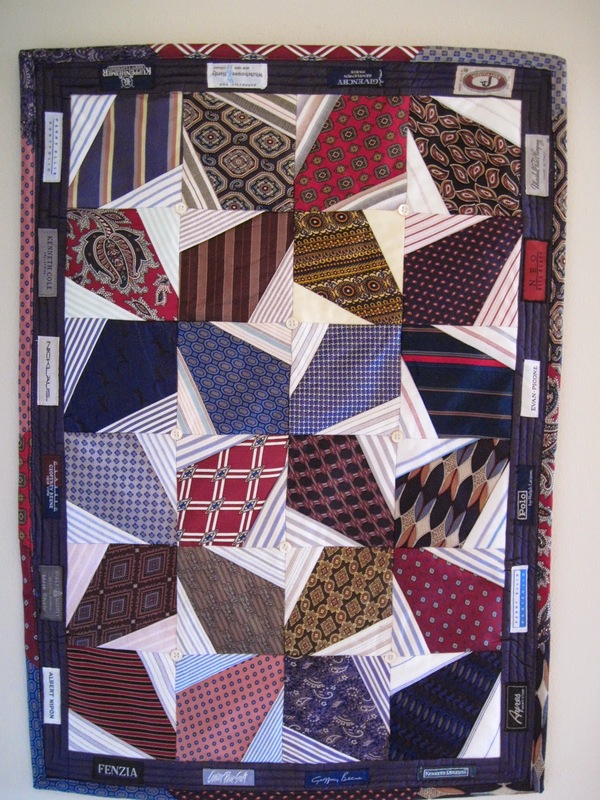 This lovely quilt was constructed with cotton fabric, machine applique and machine quilting. Columbia Lake was exhibited in the O, Canada exhibit at the 2013 Houston IQF. 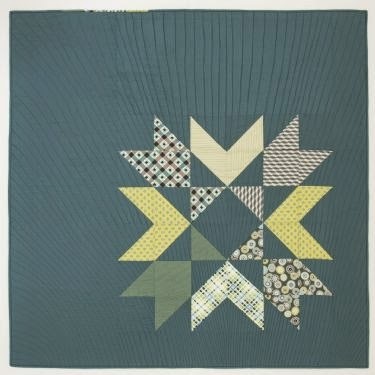 This tranquil scene was machine appliqued, thread painted, and free-motion quilted. The original design was drawn from a photograph of Columbia Lake, on Highway 93 in British Columbia. Judy Weiss says: "The wide open sky, intense blues of the lake, and the drama of the surrounding mountains is breathtaking. It is one of my favourite places on earth." In this close up photo you can see the way in which the mountains fade into the horizon. Judy Weiss says: "On this particular day, atmospheric perspective caused the mountains to fade in steps of colour into the distance before the last mountains blended into the pale blue sky. 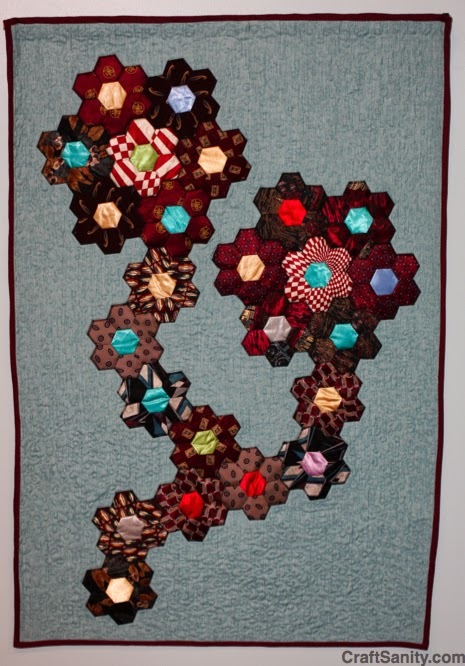 I enjoyed capturing that scene and that moment of time in cloth and stitch." 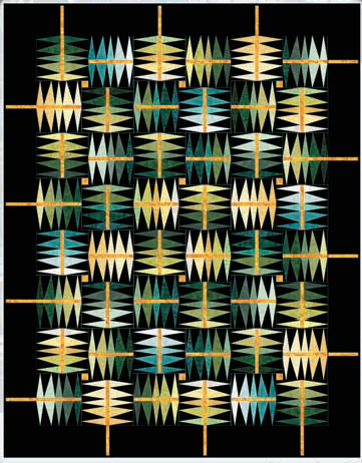 This design was inspired by Inuit imagery. Pamela says: "Whaling is a big part of their history. I envision whalers on the Arctic Sea with the Inuit, my mythical seal woman watching over them." 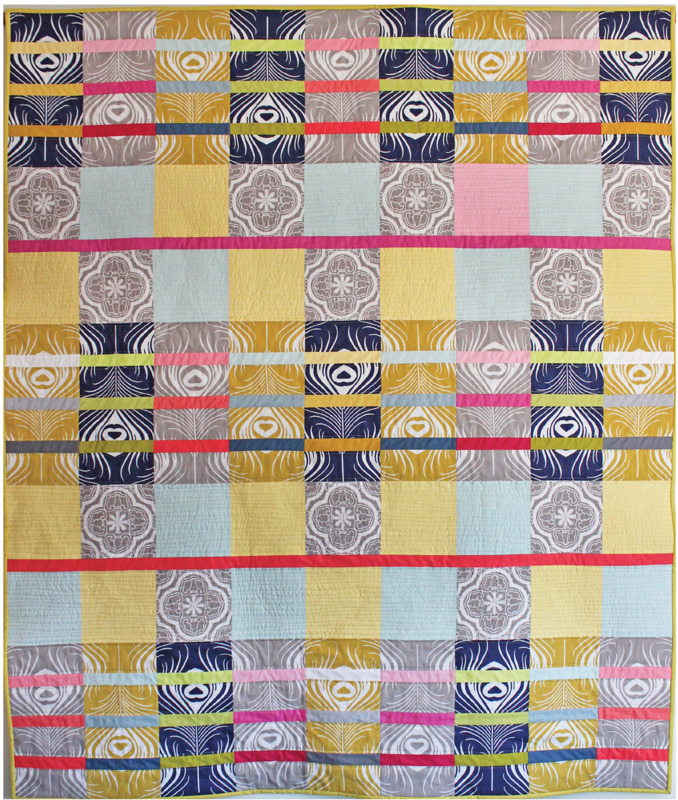 The quilt was based on an original monoprint that Pamela created in Newfoundland; you can see the monoprint at Pamelart. 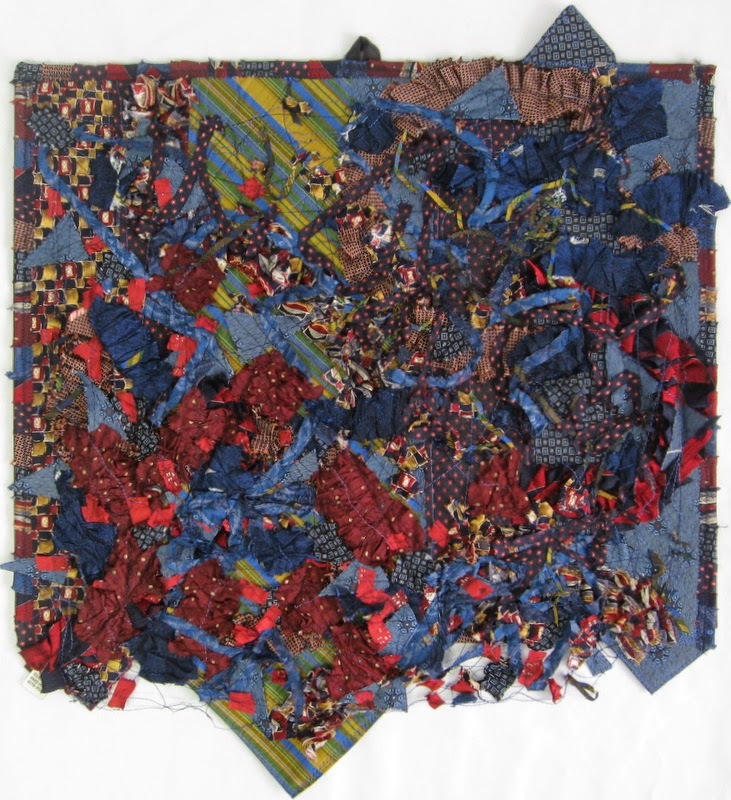 We've always admired Pamela Allen's work, and this piece was stunning in person. 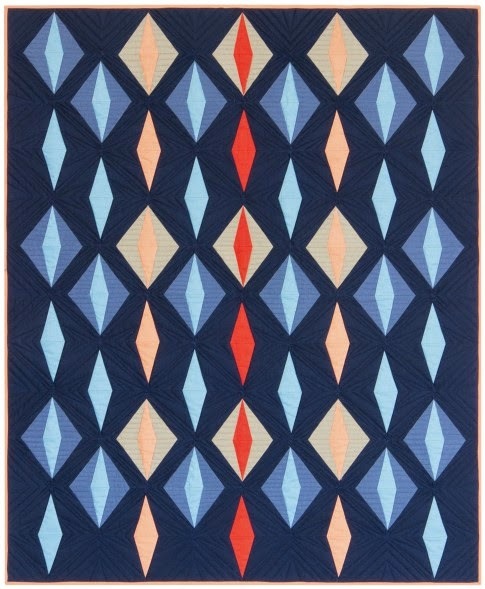 In the close-up photo you can see the blanket stitching around the seal woman applique, her face - which resembles an Inuit carving - and the small blue fishes swimming in the ocean above her. 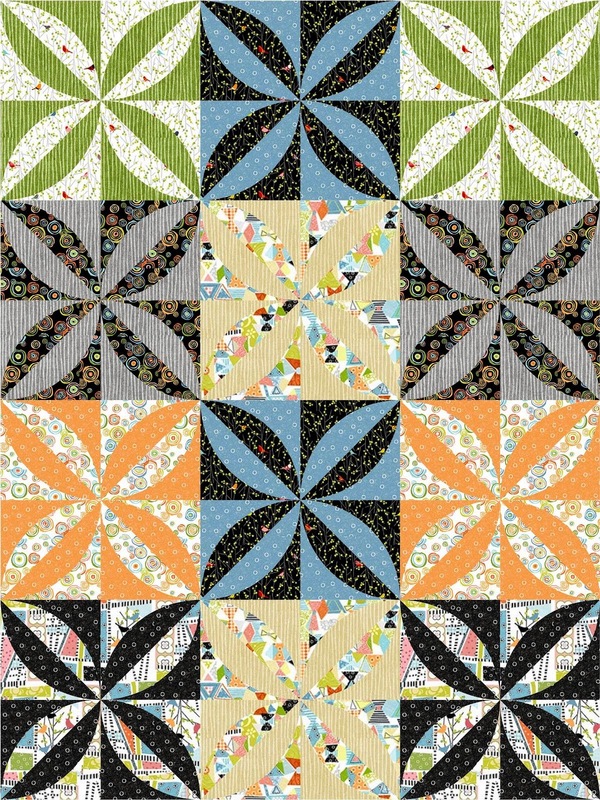 You can see the intricate free-motion stitching in the ivory background, which was detailed with the echoes of many different images including a salmon in the lower right. 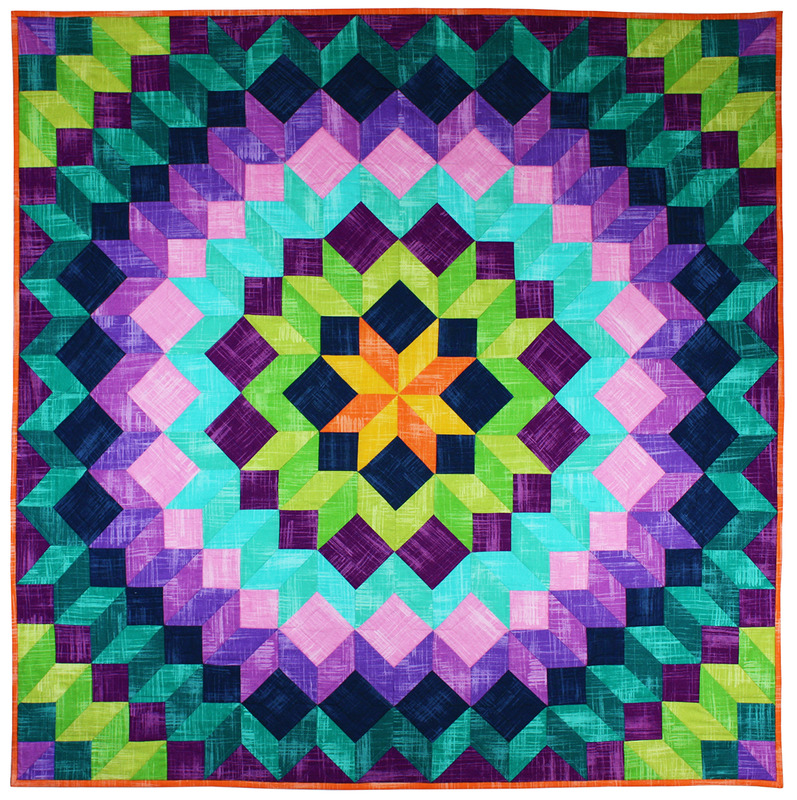 Margaret Jessop created these exuberant portrait quilts of her four children. She was inspired to depict them as the four elements, shown from left to right: water, earth, fire and air. "Katy, a swim instructor, is represented by Water; Paul, an ecotour guide, is Earth; Fraser is in a rock band and swings poi* (Fire); and Anna plays wind instruments, so she is Air." 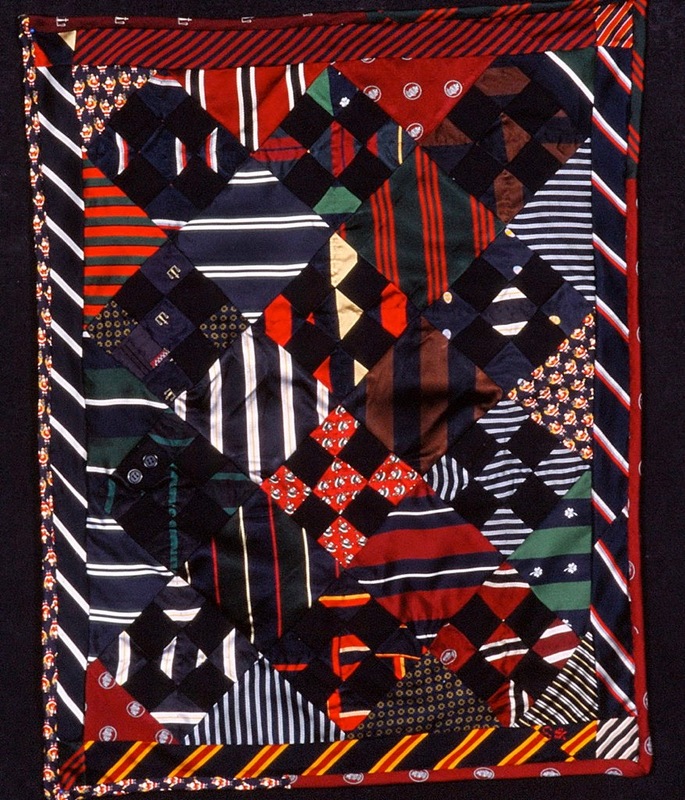 We were fascinated by the way in which Margaret depicted her daughter with a wide variety of fabric values and patterns. 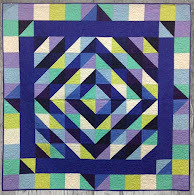 Margaret says, "I learned this technique in a class by Susan Carlson at Sugar Pine quilt shop in Canmore (Alberta)." Here is another close up which shows the way in which Margaret constructed the eye, including tiny bits of fabric to depict reflections of light. This element was one of our favorites. In keeping with the theme of her son Fraser as Earth, Margaret has depicted him in green and has woven leafy vines in his hair. 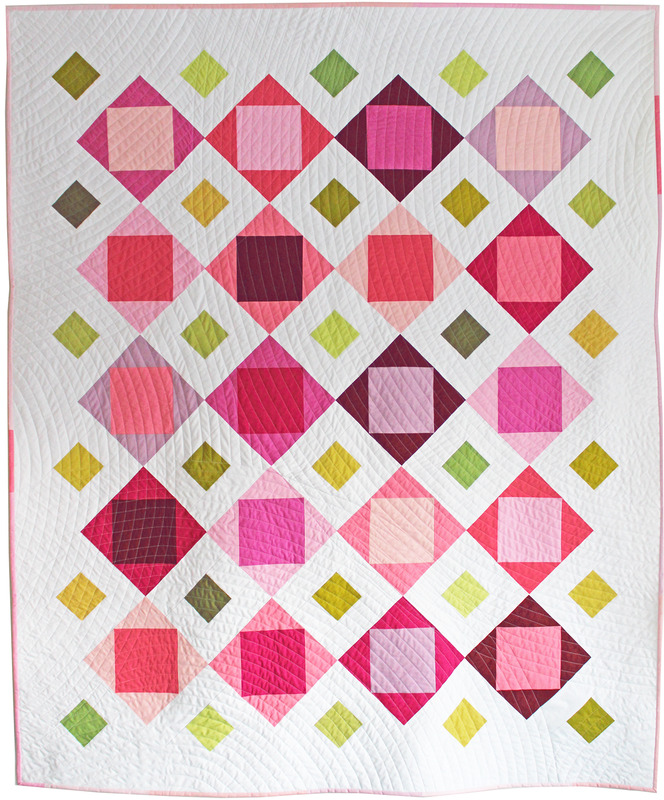 This really fascinating quilt was made with a hand-painted whole cloth background that was machine quilted. 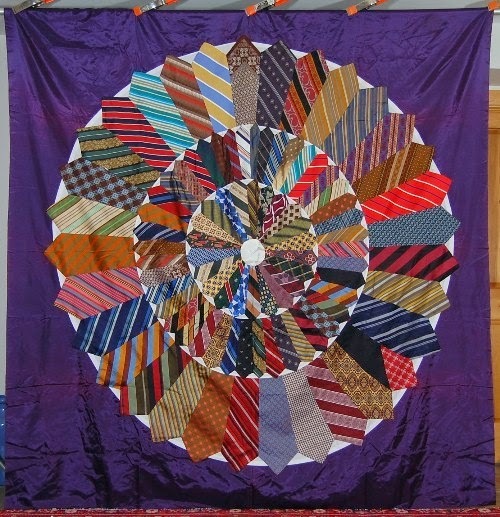 Strings of felted stones in graduated sizes were hung from the front of the quilt. In the lower right of the background you can see the single word: asking. Maggie says, "It is so important to remember to ask life for what we really, really want. 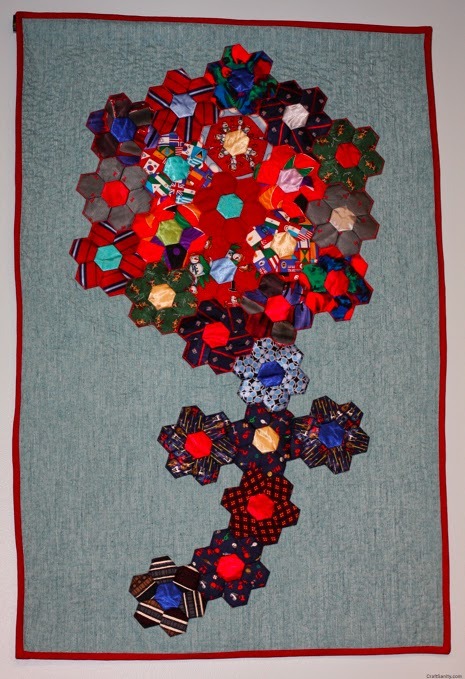 The felted stones represent wishes and prayers strung like a rosary. 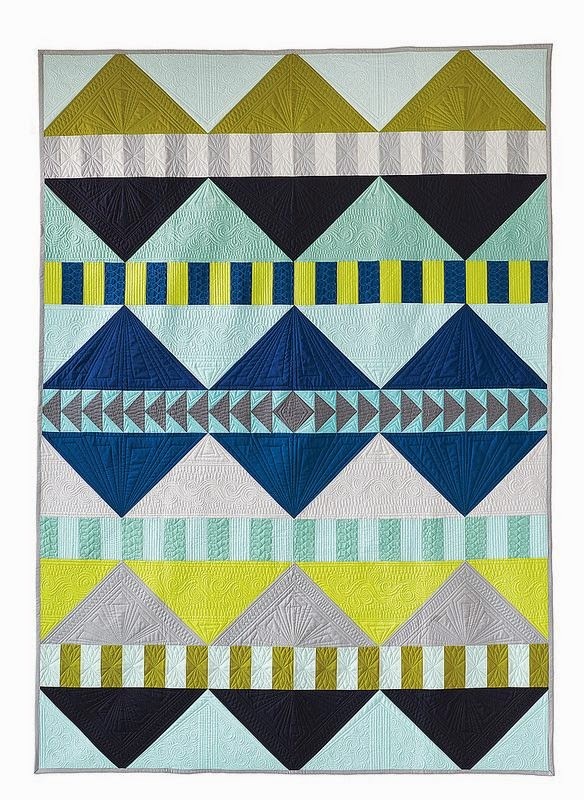 The blue is for skies, deep calm and water. The fish is jumping for the joy of being alive." 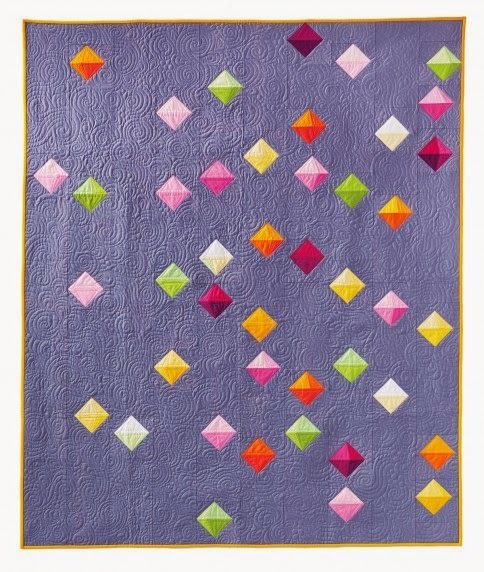 This gorgeous contemporary quilt was made in 2008 by Heather Lair, who created quilts for 35 years. Sadly Heather passed away suddenly on July 3rd, 2013. 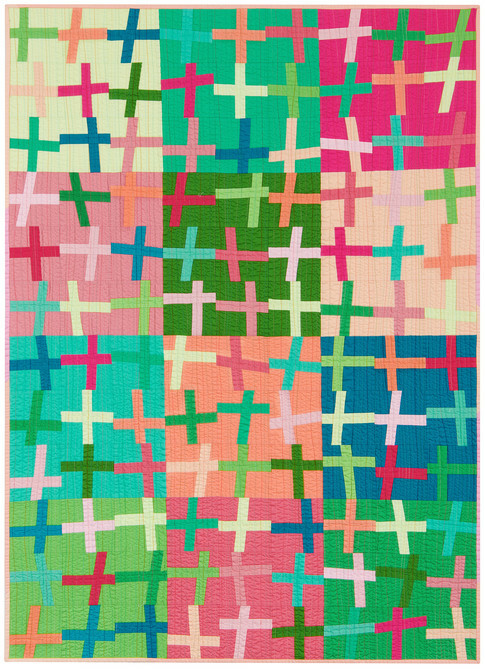 She left a incredible legacy in the quilting world. 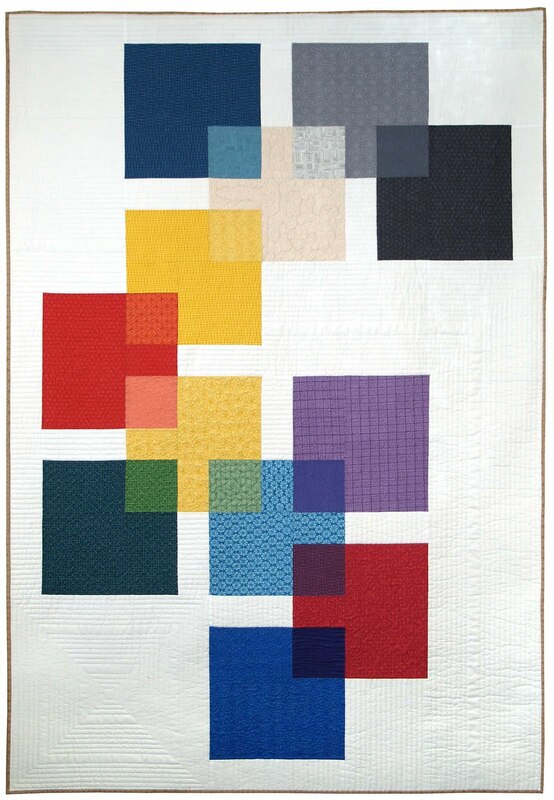 The description of Light and Gold says: "This quilt is a playful study of colour and repeated shapes. 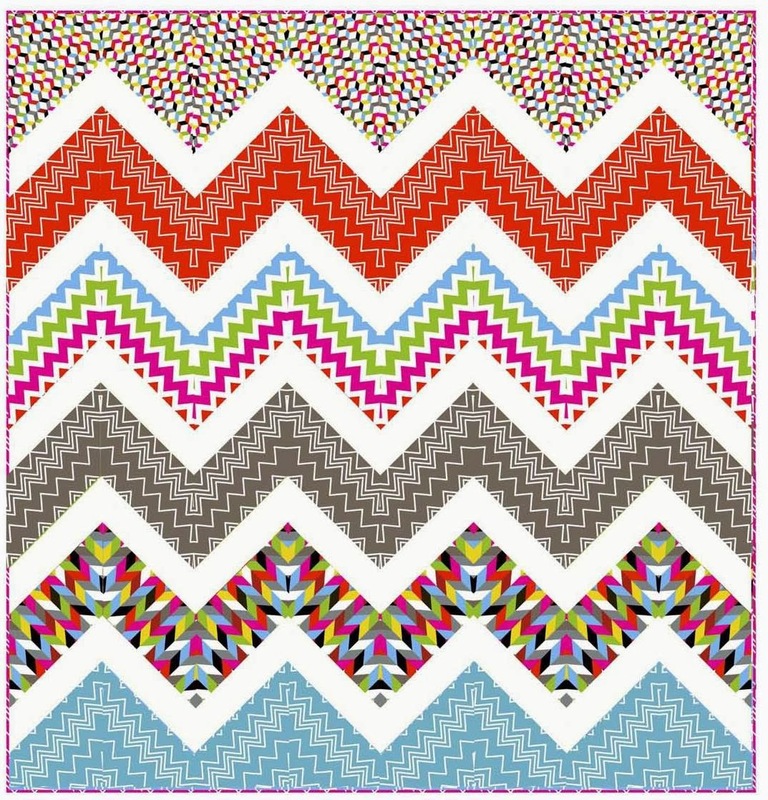 Red, usually the dominant colour, sits back and lets the blue, green and gold shapes take center stage. 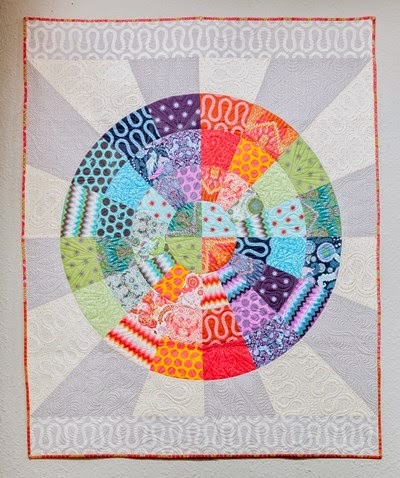 I used soft-edge spirals in the quilting designs, and a hand-dyed cream coloured border to create even more fun and whimsy in this quilt." 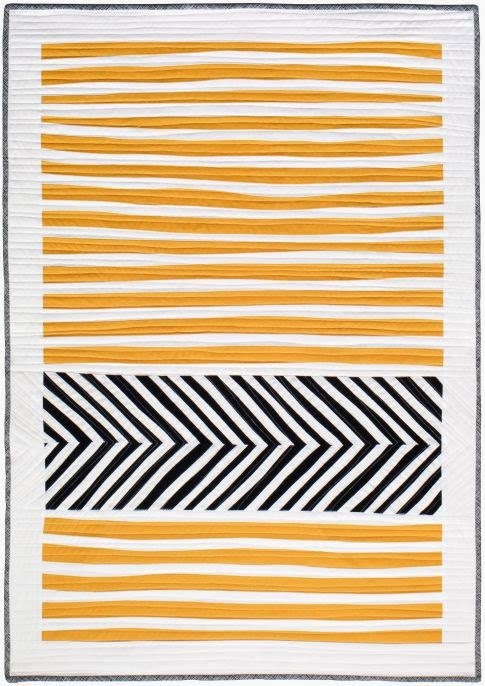 Although Light and Gold is a contemporary design, it was beautifully hand quilted, which adds a truly handcrafted touch. 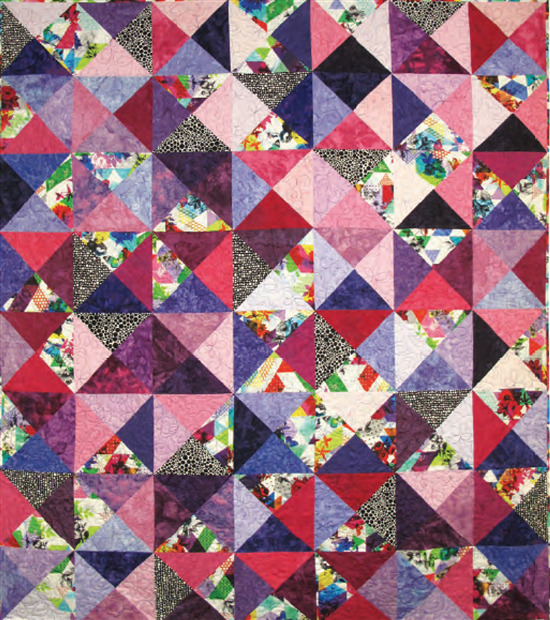 In this close-up photo you can see the overlapping dimensional prairie points that decorate the right-hand border of the quilt. 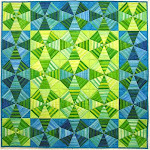 For more of Heather Lair's work, see the gallery at Heather Lair Designs. 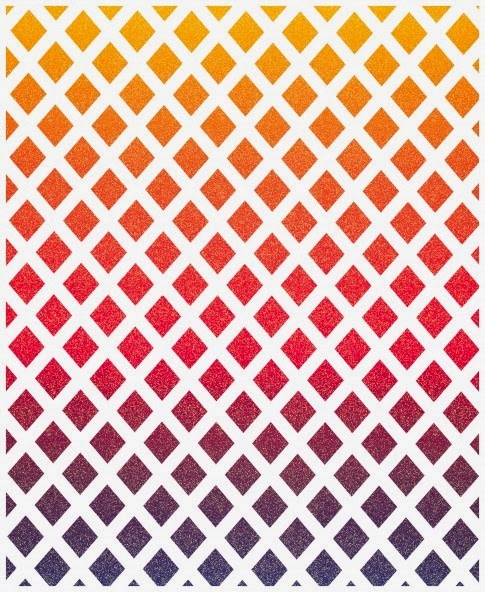 *footnote: "Poi" involves swinging tethered weights through a variety of rhythmical and geometric patterns. Poi can be made from various materials with different effects, such as fire. Poi originated with the Māori people of New Zealand. 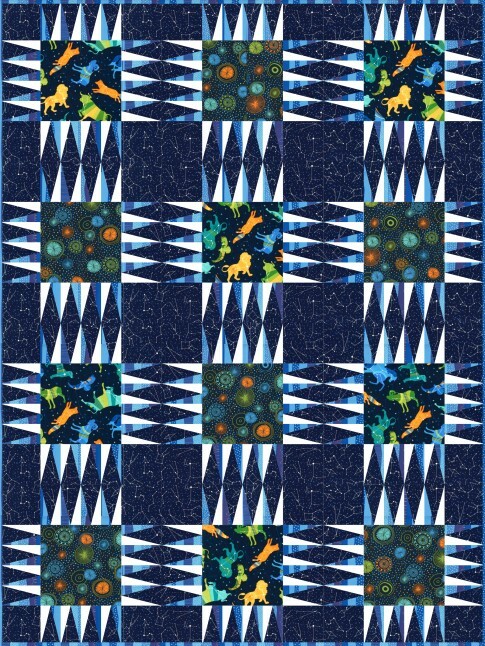 Join us "Under the Sea" today, as we show some very intriguing aquarium and ocean life quilts. Who hasn't dreamed of being a mermaid at some time in life? Put on your swim fins and jump in the water ! Christina notes, "While working on Mermaiden, I decided that she needed an underwater date (thus King Neptune was created). Both (these images) are mystical sea creatures whom I have yet to encounter in my scuba diving adventures.... The ocean is a magical experience, the colors beyond anything I have seen anywhere else. Nature at its finest." 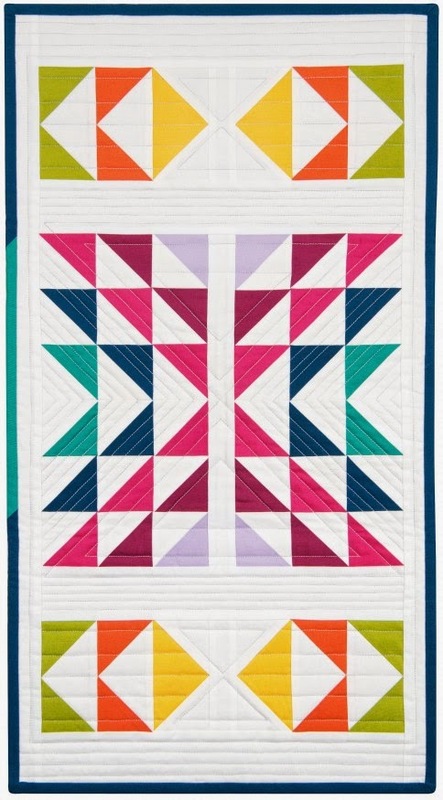 We love the innovated, wildly patterned seashell borders that frame these whimsical quilts. 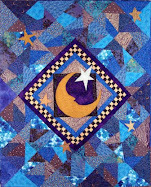 Quilted by Christina Belding and Ken Grantham, inspired by the fabric collage techniques of Susan Carlson. Miki notes, "The beauty of the The Great Barrier Reef in Australia in which I traveled was inspirational. 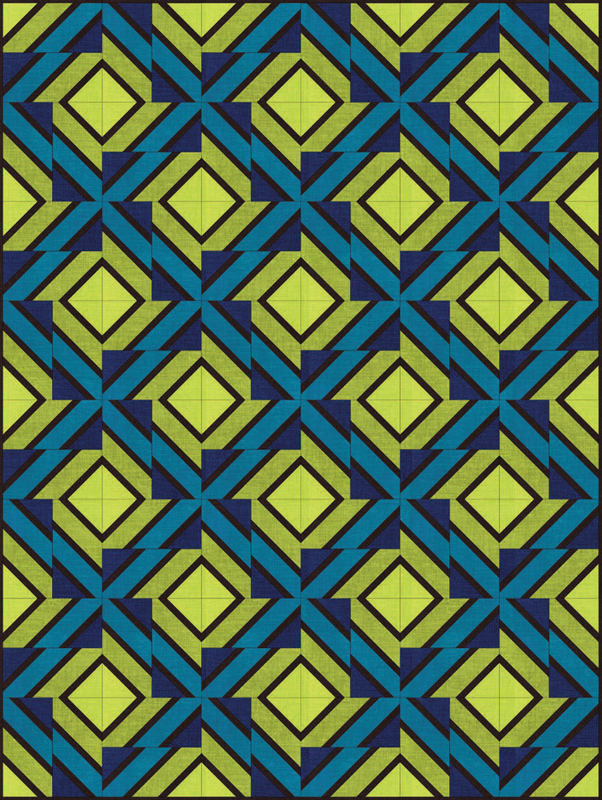 I got the idea of the quilt design from the trip." 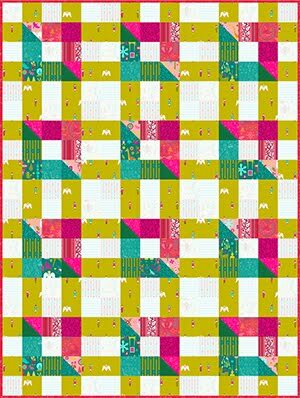 For this original design, Miki used machine piecing and applique, satin stitch, fabric fusing, and machine quilting. 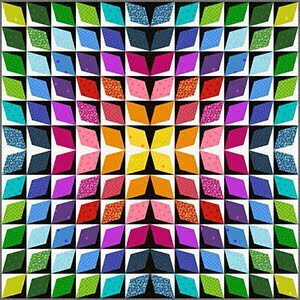 Her use of high chroma complementary paired hues such as blue and orange, pink and green, and purple and yellow, creates a vibrant, eye-catching display of color. 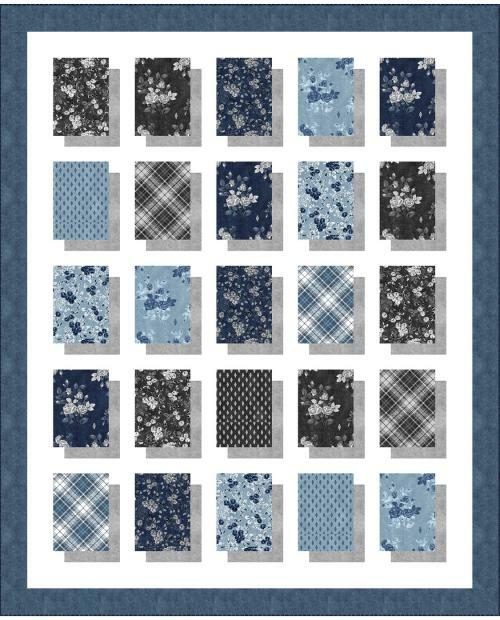 Yoshiko says, "The idea of a pair of quilts is adopted from traditional Japanese sliding doors. I especially tried to detail the muscles, which control the beautifully delicate movement of fins." 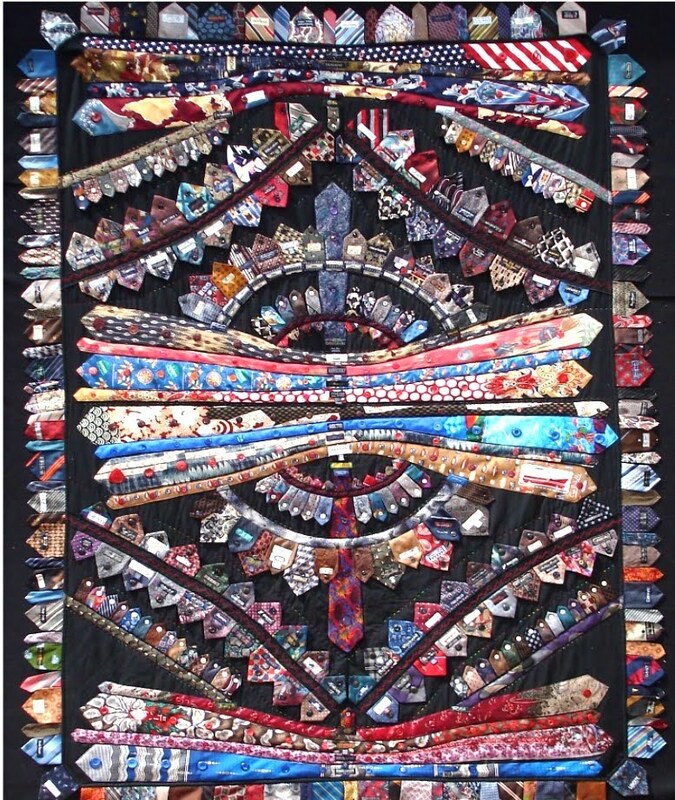 The two large quilts were hung exactly side by side, so they are just touching, and the fish were about 3-4 feet tall. Notice the rays of sun shining through the water and the realistic bubbles in this enchanting scene. In this close-up, you can see some of the very subtle and effective shading of the fish and the background. We were very impressed by the intricate precision used by Yoshiko to depict these elegant fish. 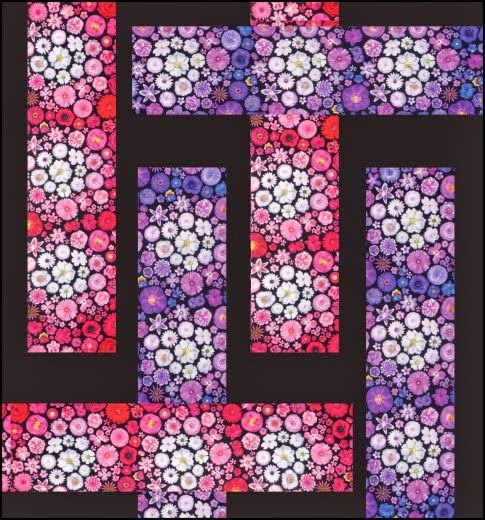 Yoshiko's techniques include reverse applique, painting, and machine quilting. 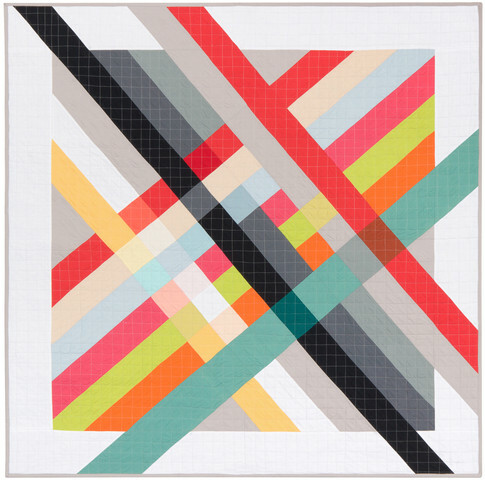 Her original design was constructed of cotton and the edge fabric tape of a Japanese tatami, a straw mat. 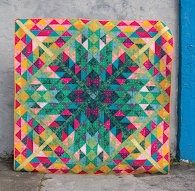 Claudia notes, ...."Trying to catch my dreams in my quilts, not following the rules- just following my visions! Welcome to the Mermaid's Castle. It is a magical place filled with beauty and wonder. Here, at the Castle, you will find the beauty of the corals, reminders of the Great Barrier Reef in Australia. Look closely to discover the bubbles, plant life, and underwater wonderland. Watch as the Mermaids invite you in to visit this magical.... oasis." 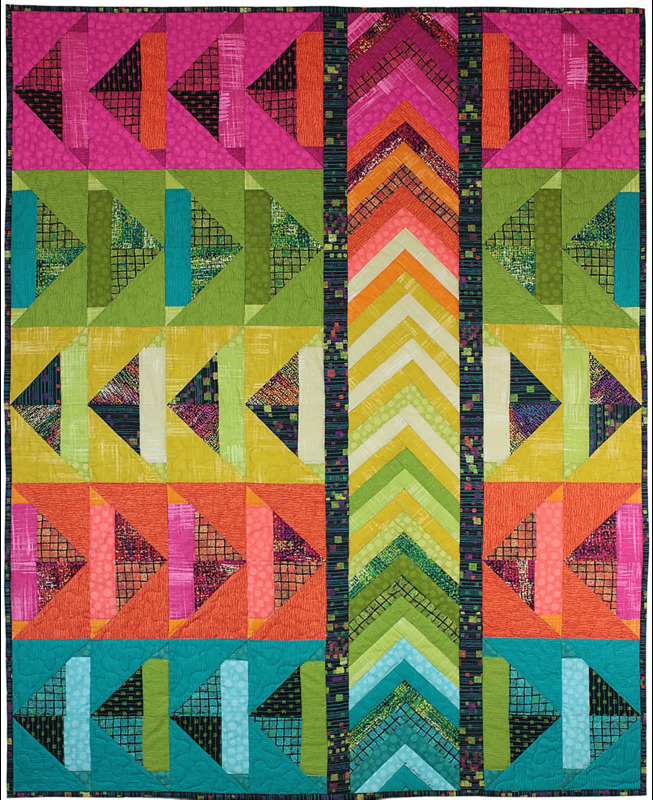 The Magical Mermaid's Castle was awarded 1st Place - Innovative at the 2013 Pacific International Quilt Festival. 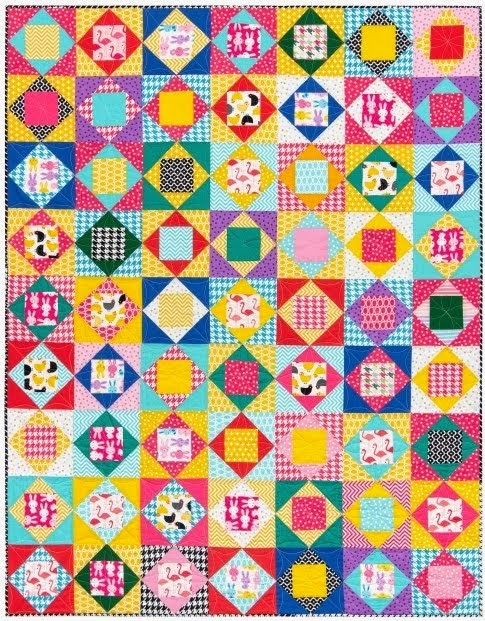 A large variety of very admirably done quilting patterns adorn the foreground and background, along with jeweled embellishments. 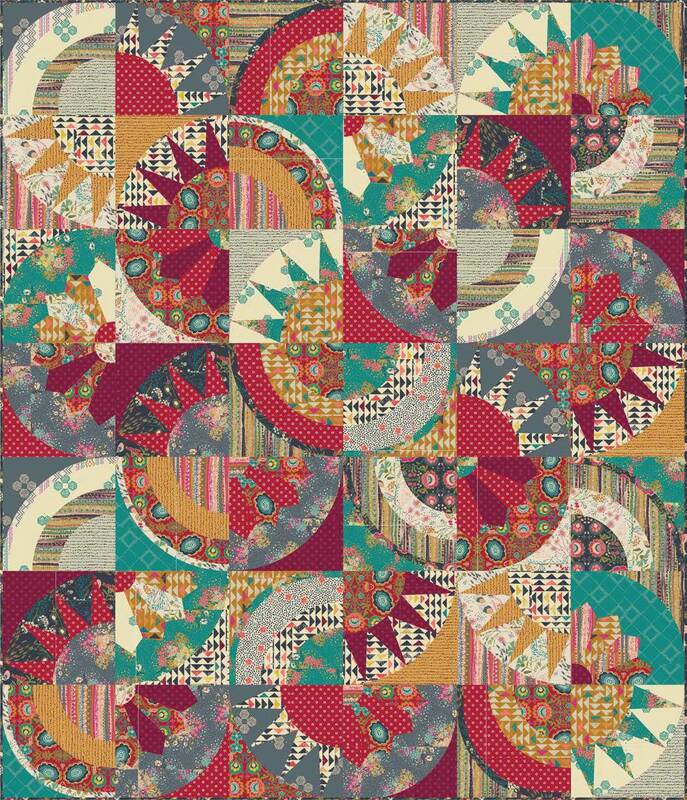 This fascinating original design is machine appliqued, machine pieced, and long arm quilted. 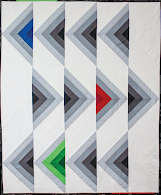 Shelli notes, "The inspiration for this quilt came while on a cruise. I wondered, 'Where do mermaids sleep?' 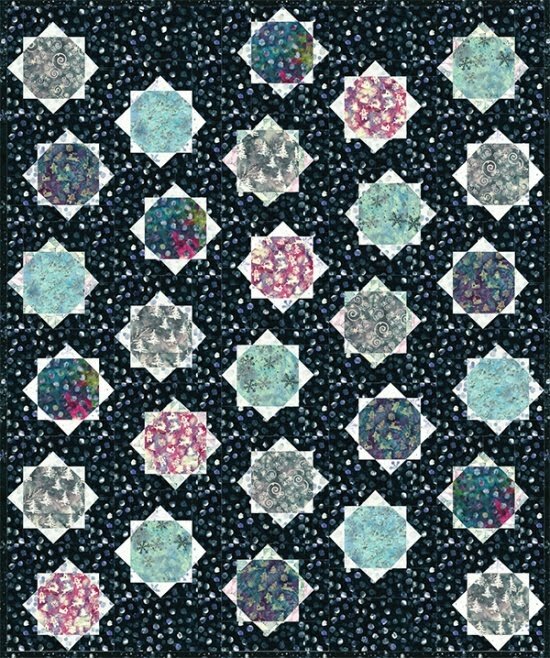 Background designs were quilted onto heavy-weight interfacing, trimmed, hand painted with Shiva paint sticks, then re-appliqued onto the quilt. Mermaid and baby were colored with inks, then hand beaded. " 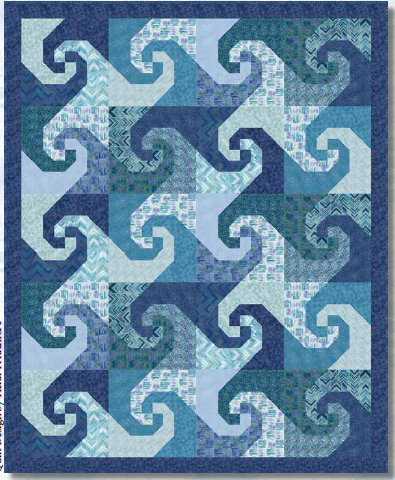 Artistic wavy lines of parallel quilting perfectly symbolize the undulating and ever-changing ocean currents. 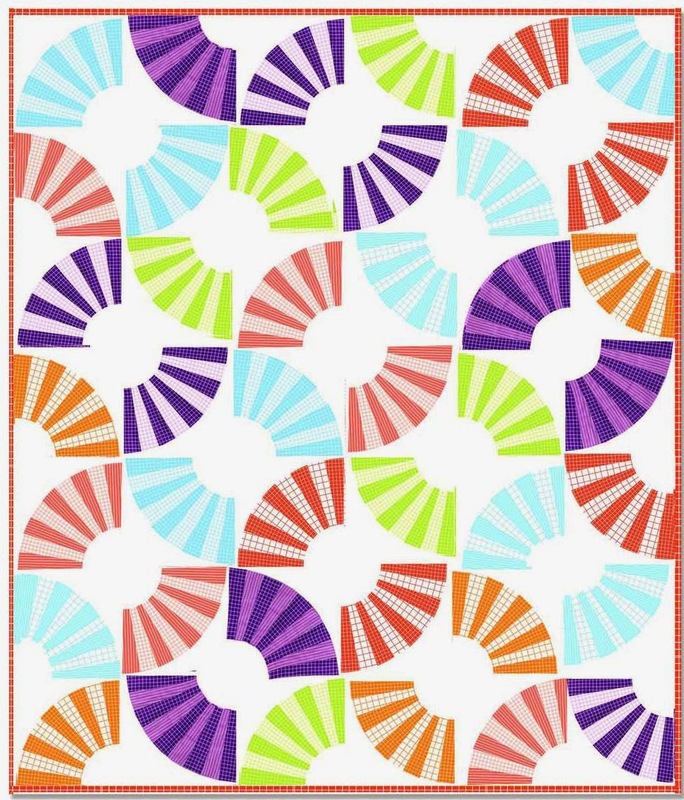 Shelli notes of her original design, "The cure for everything is salt water: sweat, tears, and the sea." 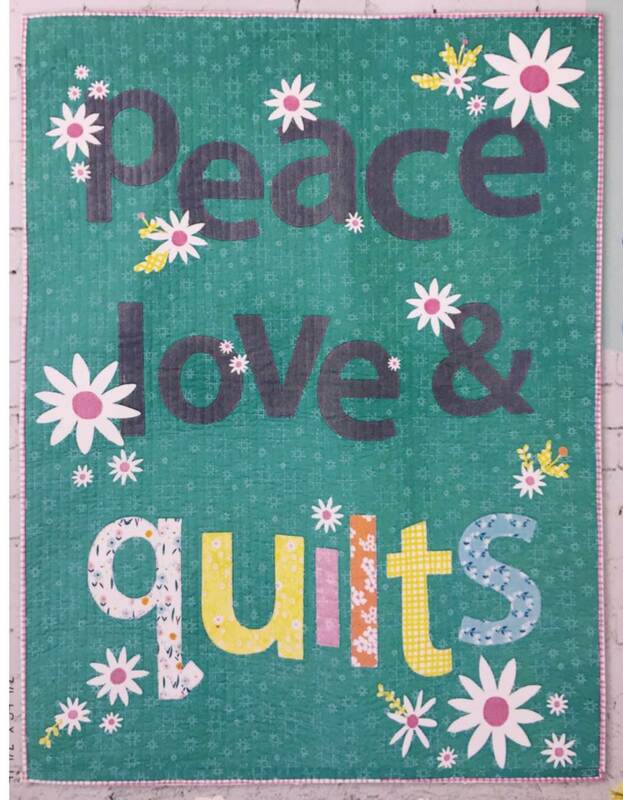 Wanting to challenge herself, Terri VandenBosch designed this quilt - from piecing to embroidery designs - in Art & Stitch Software. She says, "It was so worth the effort to try something outside the box!" 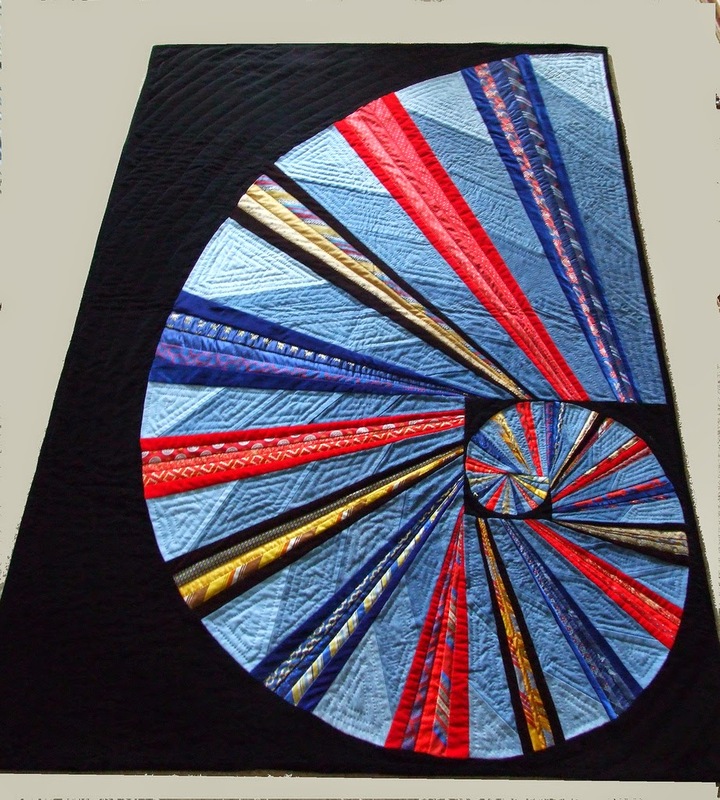 The four compass points of the center medallion are embroidered with spirals resembling the nautilus. 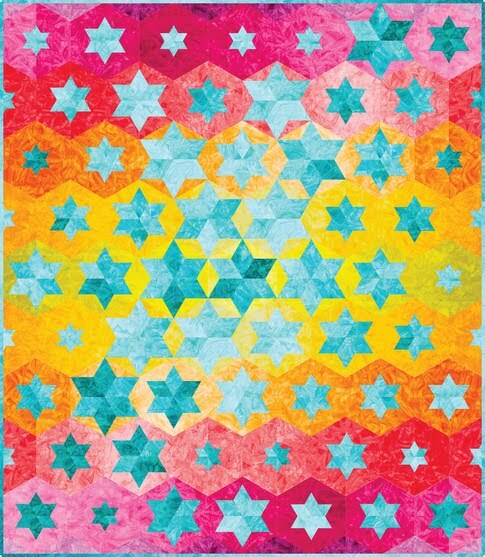 The coral and blue fabric is printed with starfish. 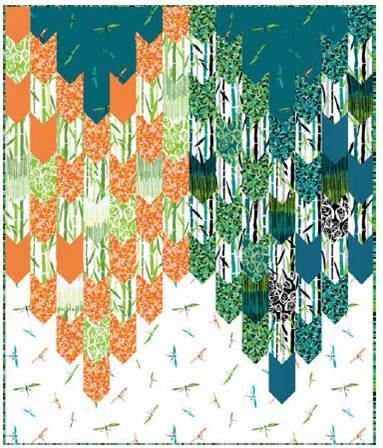 We love these adorable dancing sea horses who appear to almost be kissing among the waving, embroidered seaweed. 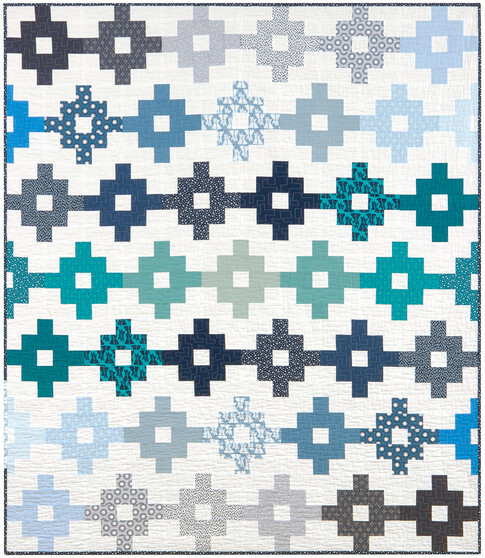 Terri's embroidery and quilting patterns work very well with the symmetrical curves of this quilt. 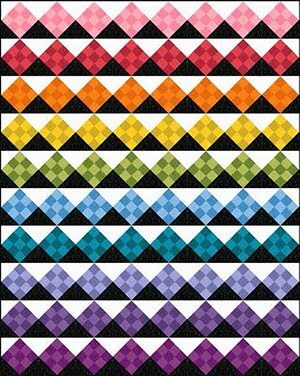 Image Credits: Photos were taken by Quilt Inspiration at the : ﻿2014 Road to California Quilt Show, 2014 American Quilters Society Show, 2013 Houston International Quilt Festival, and the 2013 Pacific International Quilt Festival. 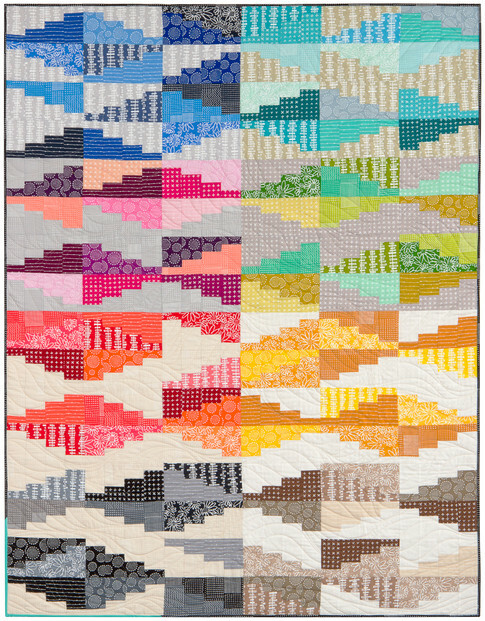 Here's a quilted tribute to the seemingly endless variety of birds that exist in the world of nature. 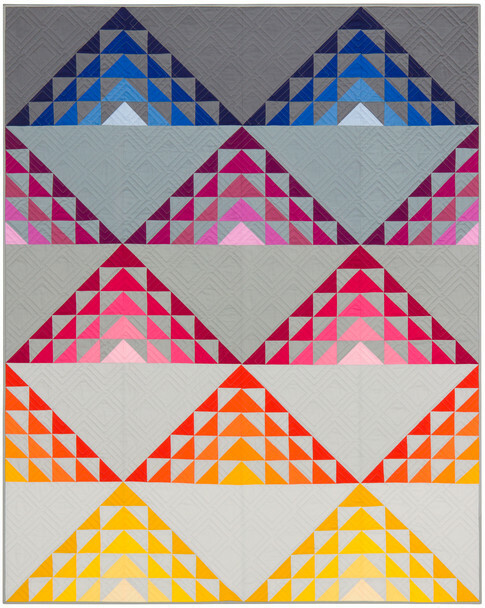 Today, we're bringing you some outstanding quilts with very life-like representations of birds. Virginia states, "Legend holds that black ravens were kept at the Tower of London to protect the monarchy. My piece presents a rare white raven to the Tower and ask the question of what that would mean for the monarchy and the Tower." 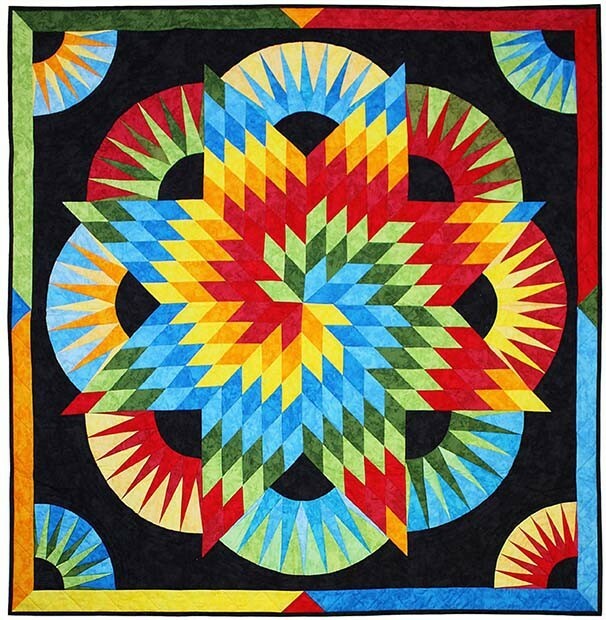 Inspired by a photo by Mike Yip of the white ravens on Vancouver Island, Virginia used machine applique and machine quilting to create this striking piece. We really admire the intricate details in the bird's feathers and especially in the creation of the Tower in the background. 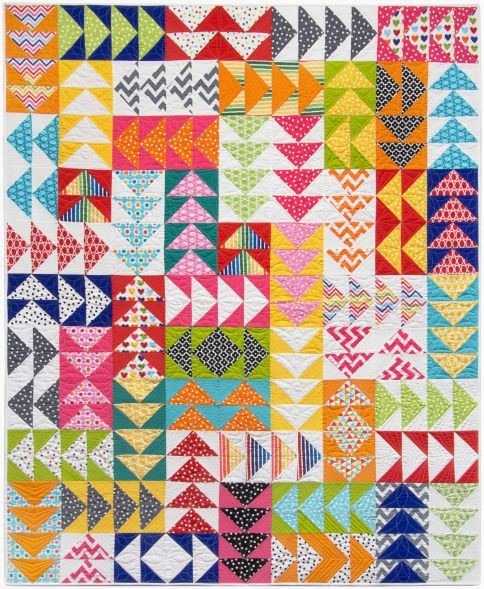 Barbara writes, "While in Botswana, Africa, on safari in the spring, I photographed a colorful bird, and it inspired this quilt." The bird, a Lilac Breasted Roller, is highlighted against the pale blue dye-painted background. 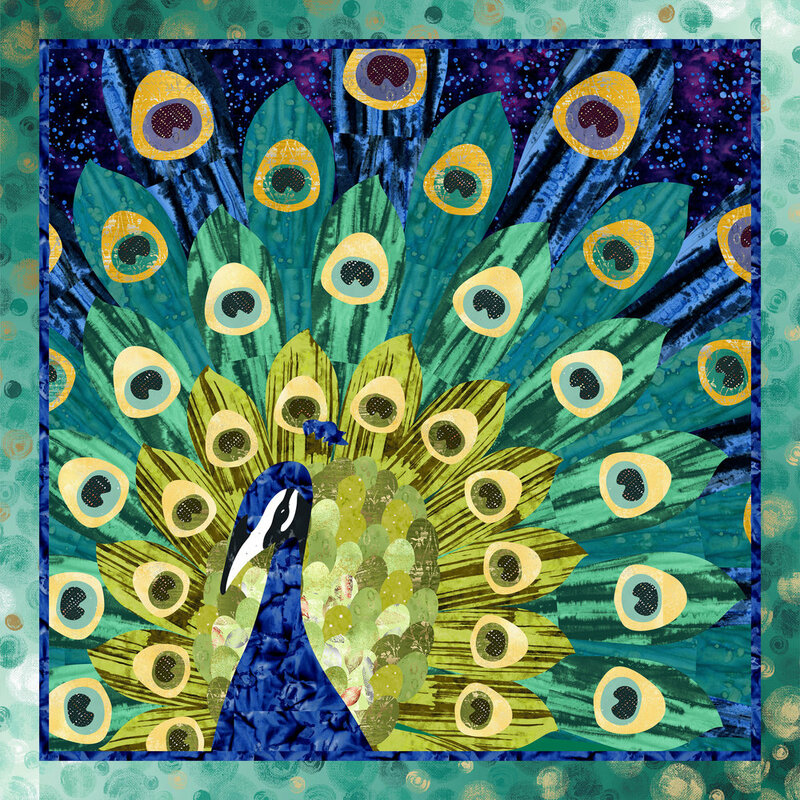 Barbara has done a wonderful job of conveying the stunning colors of this exotic bird with her combination of digital imagery and quilting. 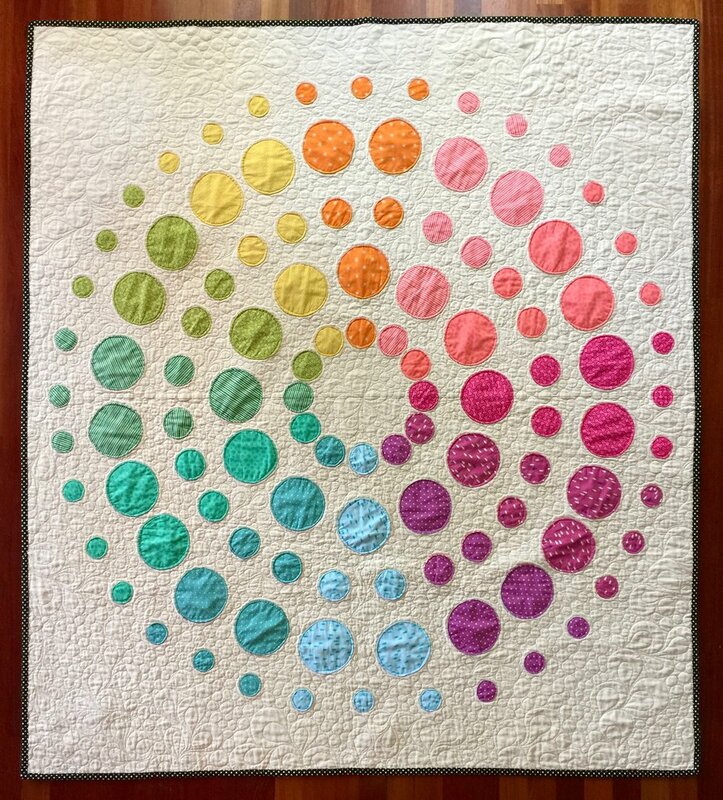 Barbara notes that her techniques include photo transfer, dye-painted silk, machine applique, and quilting. 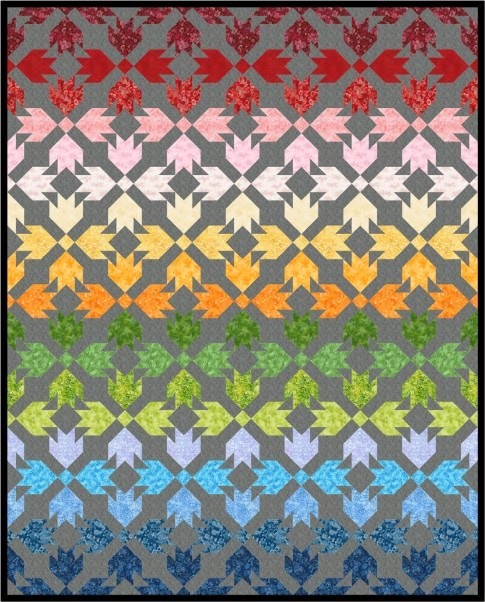 Each section of the bird was finely stitched in a different color to match the underlying image. Margery notes of her original art quilt, "I enjoy doing close-up views of animal faces, and this look of intense concentration makes you feel as if you are really face-to-face with this awesome eagle." 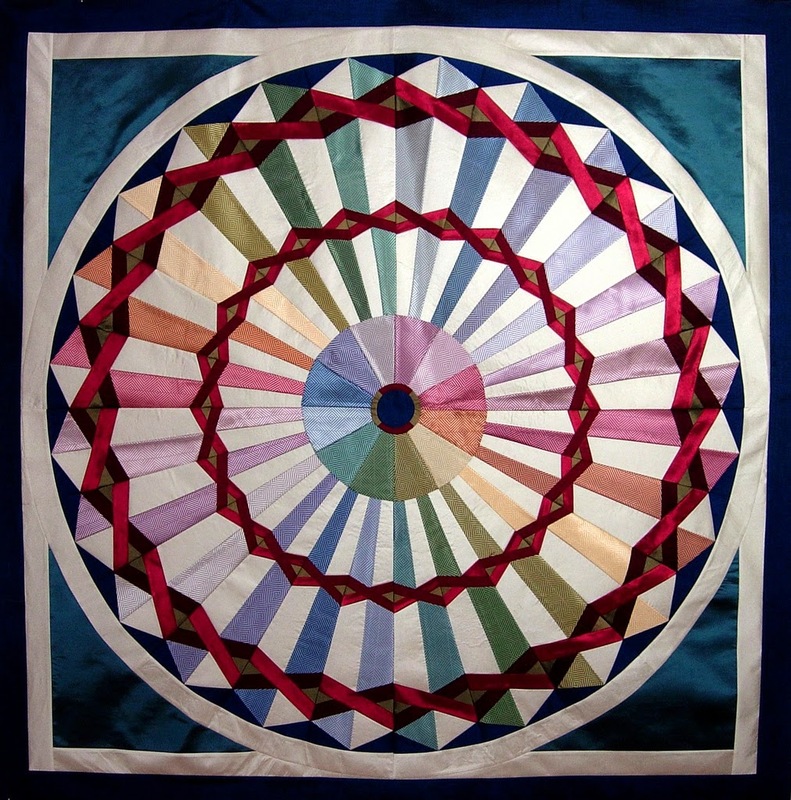 Margery's techniques include hand painting with jacquard textile acrylic paint, machine thread painting, and quilting on cotton fabric. We are impressed with the fierce, compelling look Margery has captured on the eagle's noble countenance. Did You Wash Your Beak? 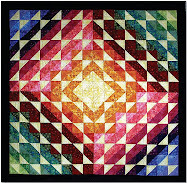 by David Taylor, Colorado, USA..
David Taylor's applique quilt was inspired by a photo by Steve Byland. 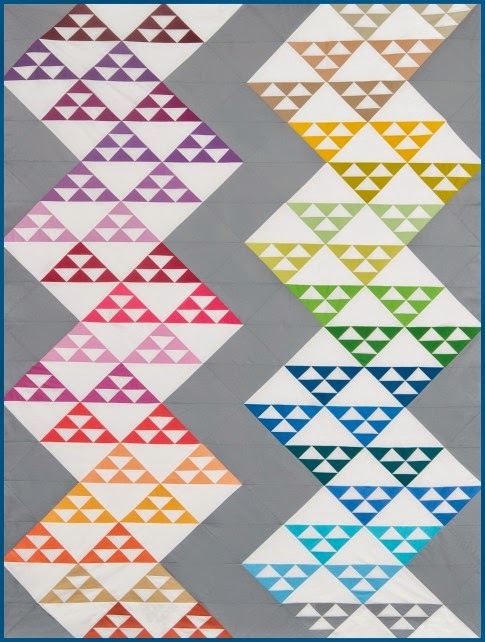 David notes, "Bird have always been my favorite subject matter to turn into quilts. I hope I captured the attitude of the mother bird, as she looks appalled at her baby's manners. 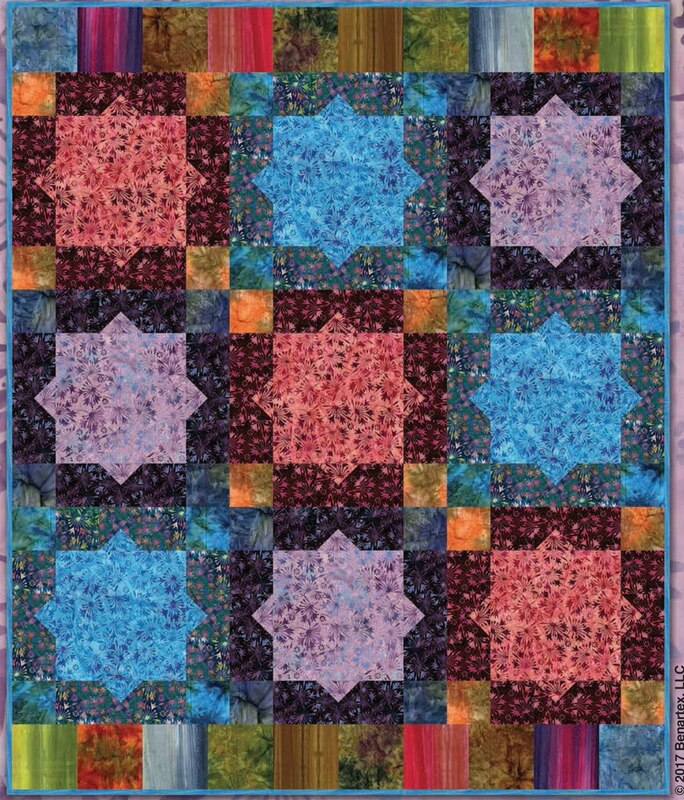 I spent weeks debating with myself over the background color, and ultimate stayed true to Steve Byland's photo." 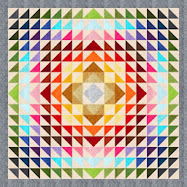 Winner of a Judges' Choice Award by Carolie Hensley at the 2013 Houston International Quilt Festival, David's materials include commercial cotton prints and purchased, hand-dyed, painted fabrics. 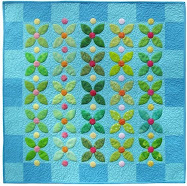 In addition to the details on the birds, we admired the leafy textures in the background of this quilt. 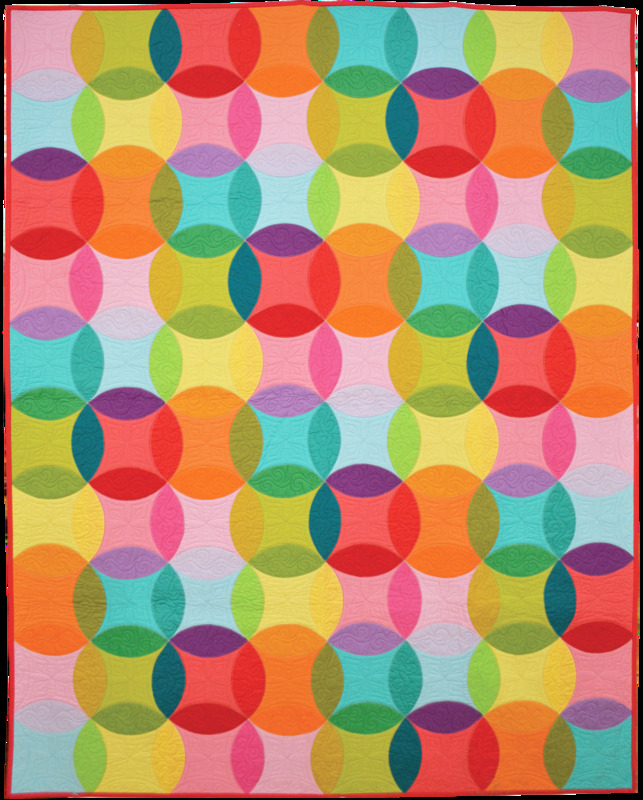 David will be teaching his techniques at the March 2015 Empty Spools seminar. 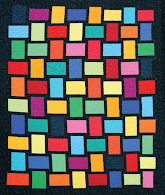 Second place winner in the Wall Quilt category at the 2013 Pacific International Quilt Festival, Cherrie states, " "I took a jump into art quilting when I began learning about paint and other product to apply color to fabric. 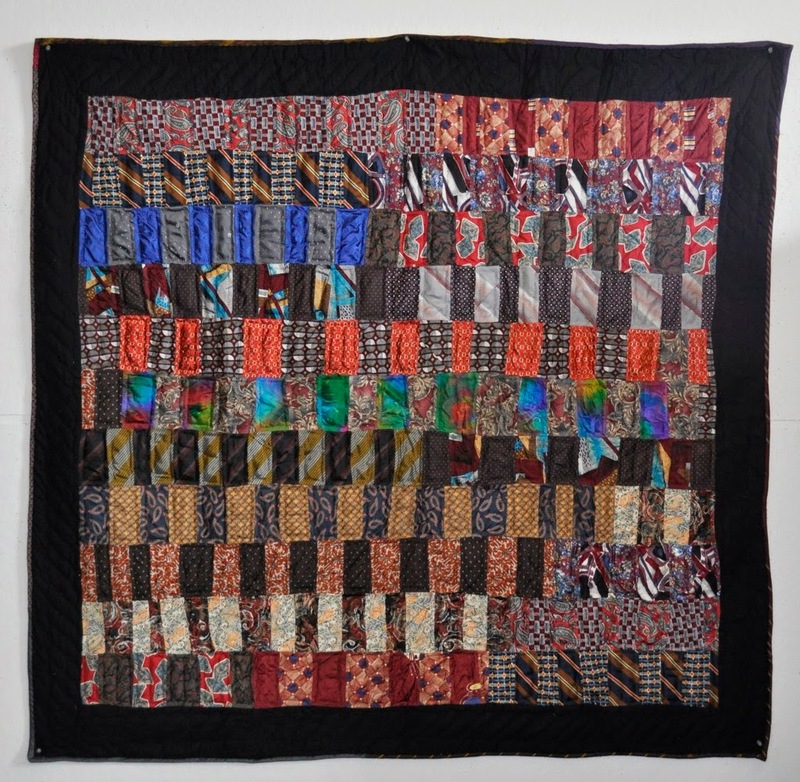 Without patterns to follow, I feel the freedom to create fiber art which, although built on a traditional quilting background, expands that framework to personally expressive art using my fiber fixation." We love the realistic look of these darling babies as they sit in repose amongst a beautiful background reminiscent of a Claude Monet impressionist painting. 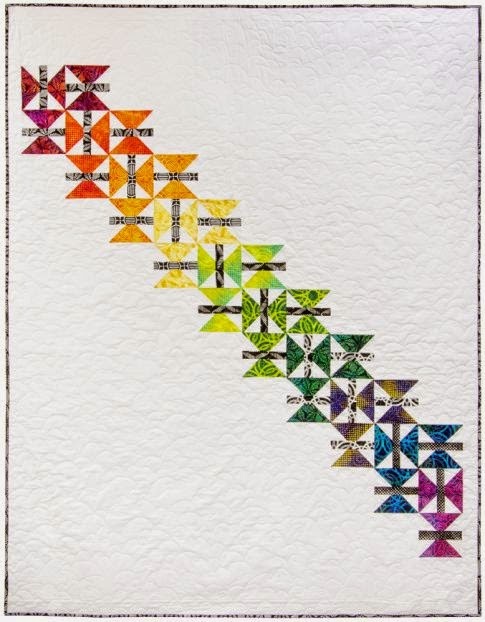 Cherrie expertly created her original piece using ink painting, machine applique and free-motion quilting. 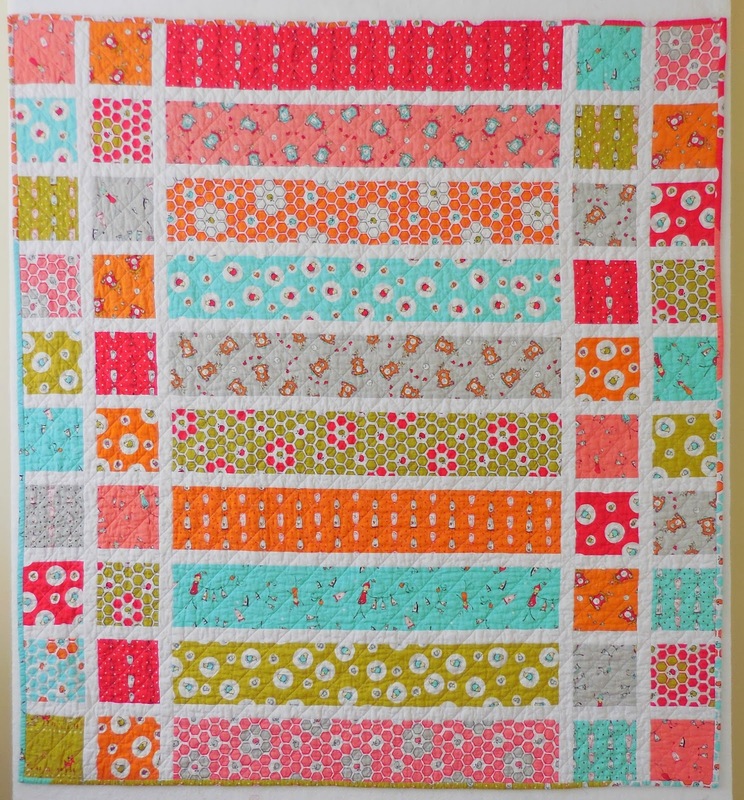 Angelina, net and other embellishments were added. 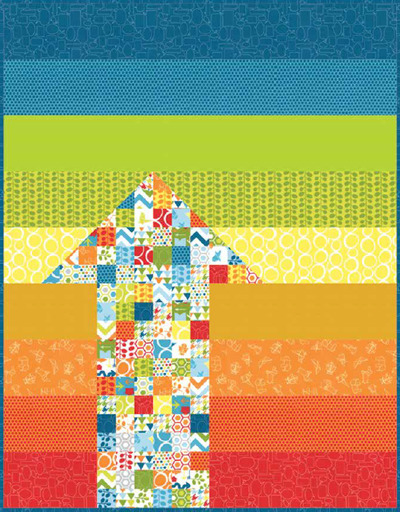 Third place winner for Pictorial Art Quilts at the 2013 Houston International Quilt Festival, David notes, "This is my second rooster quilt, and this one has a whole lot more attitude. 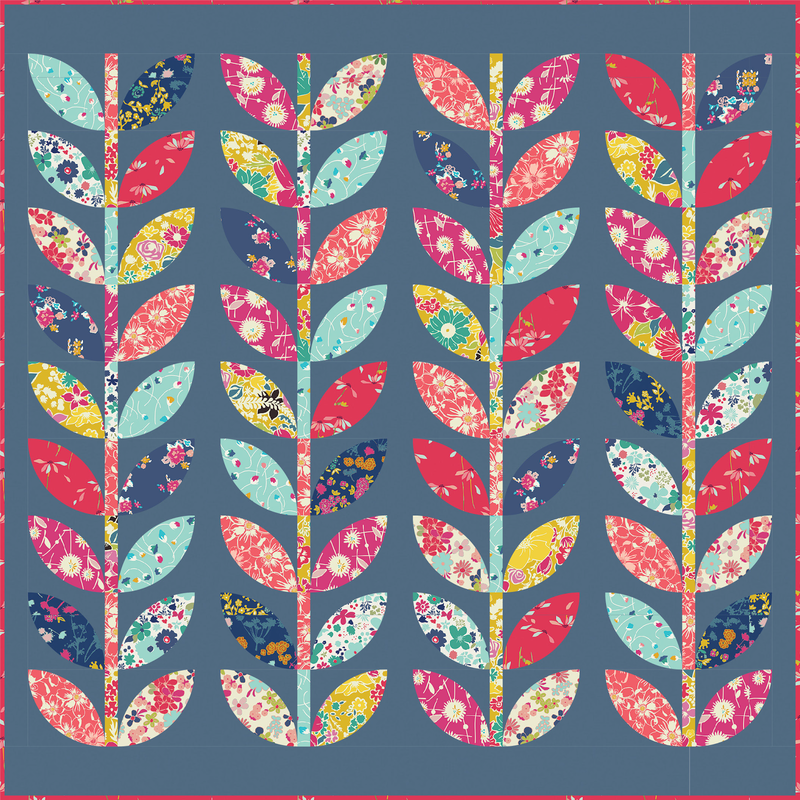 Finding the perfect hand-marbled fabrics was the key to the feathers......that, and amassing enough different red "textured" prints for his wattle." David's original design was inspired by a photo by Robert Churchill. 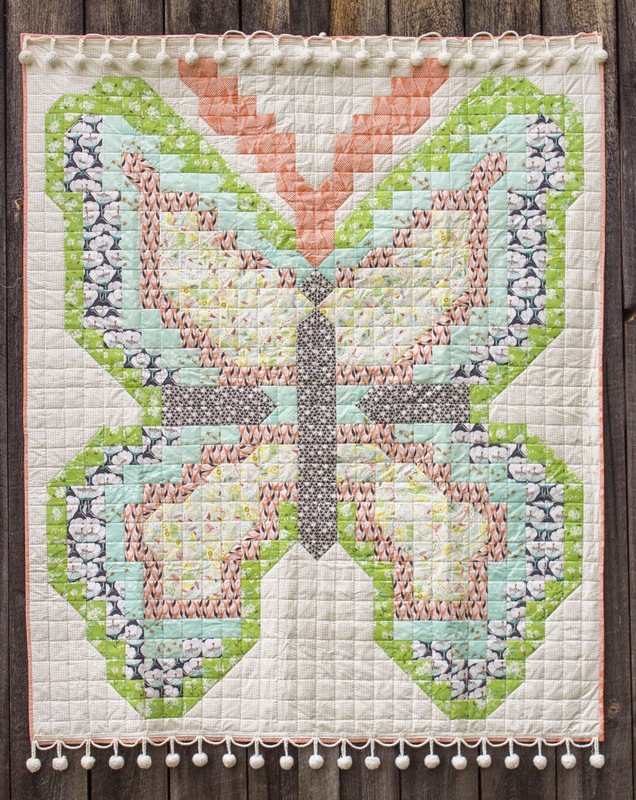 It was created with commercial cottons, purchased hand-dyed, painted fabrics, and variegated cotton thread.